You can listen to this episode above and subscribe to our podcast on iTunes. You can also listen to this episode on Stitcher, Cyber Ears or download it on Archive.org (64mins, 48MB). 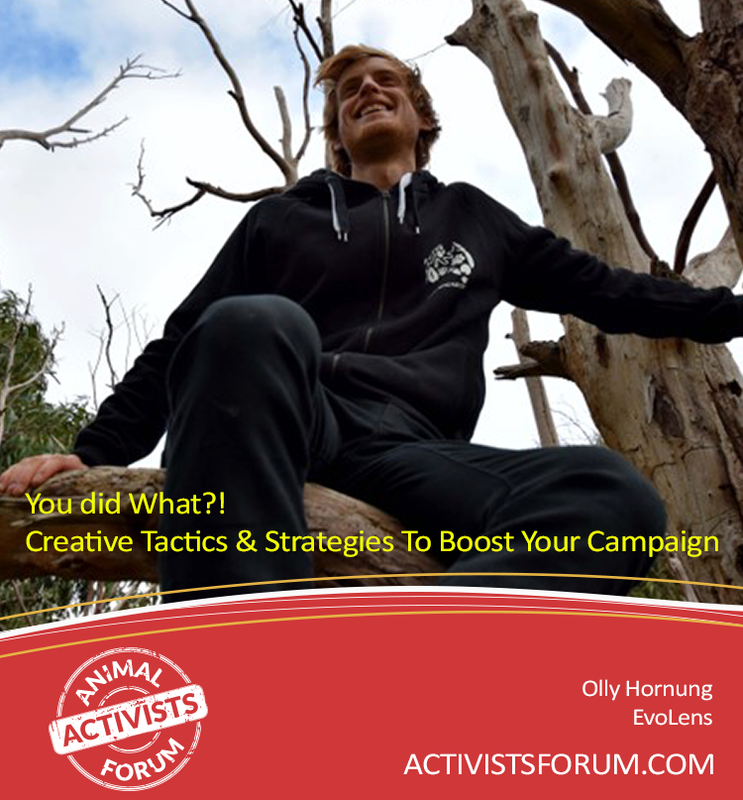 This episode features Olly Hornung’s talk: ‘You did what?! Creative tactics and strategies to boost your campaign’. Olly is part of the Evolens Collective and the talk is based on information from Beautiful Trouble. We touched on the importance of creative activism and viewing protest marches as just one of many possible tactics way back on episodes 27, 29 and 30. Audio of Katie’s talk with Dr Lara Drew: ‘Working Together to Challenge Hierarchies and Discrimination in the Animal Advocacy Movement’. Nick’s talk: ‘Academic and Activist Reflections on the Animal Advocacy Movement’ – audio, PowerPoint. Video of Sam Tucker’s talk: ‘The power of a leaflet: effective activism for farmed animals’ – part 1, part 2. Audio of most of the talks will be available on the Animal Activists Forum website soon. This site also has links to their social media pages, for those wanting to be notified of future forums. Talks recorded by Kate from Freedom of Species, an animal advocacy radio show on 3CR. Freedom of Species is broadcast live 1-2pm Sundays on 855AM for those in Melbourne. If you’re outside of Melbourne, you can live stream the shows at 3cr.org.au and old episodes are available through the Freedom of Species website and via iTunes. Also covered throughout the episode is: Sad Grrrls Festival, Spring Vegan Festival, #disrupt2017, 5 Day Slaughterhouse Fast and Justice Camp and pigtruth.com. Antonia and the Lazy Susans ‘I don’t like you’, Olly Hornung’s talk: ‘You did what?! Creative tactics and strategies to boost your campaign’, Garfunkel and Oates ‘Save the Rich’.